The blog name should be self-explanatory so if you need help with this one… The Tagline should be a brief description of your blogs content with at least a main keyword in it. You can change these at any time but I suggest once you start blogging on a regular basis and submit your blog to various directories and the search engines come around and crawl your blog you should leave them alone. 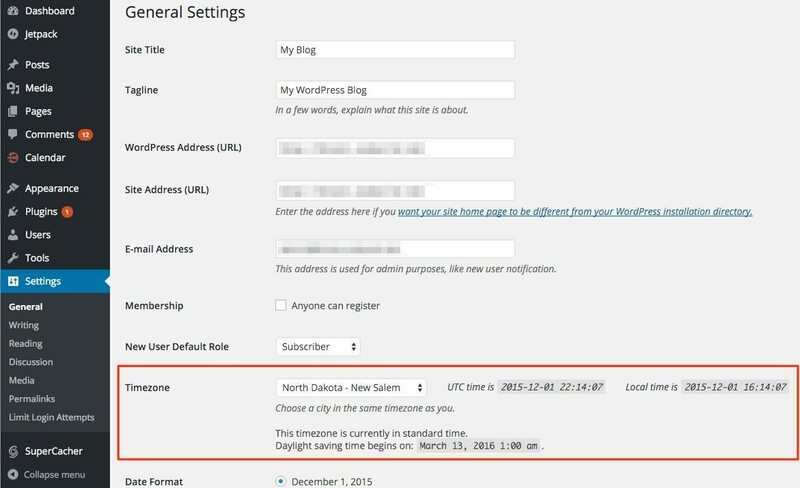 If your WordPress address and Blog address doesn’t have the www in front of it in you can add it to both of their boxes. Both of these boxes should match (unless you specified the change from the guide linked to above) or issues will arise in the dashboard when browsing for old posts. The E-mail address is used for the blog to communicate to you and for various options such as new comments or new users added to the blog. It will also be used with some plugins to send an email to people who might comment on your blog. To make your blog interactive as possible this should be an email account that you check frequently. I highly suggest unchecking the Users must be registered and logged in to comment box to encourage comments, interactivity and repeat traffic to your new WordPress blog. Simply figure the difference between the current UTC time shown and your local time and place the difference in the box next to “Times in the blog should differ by:“.